POKHARA, April 16 : Seti River is named Seti (white) due to the apparent purity of its water. However, because of the residues and chemical drained into it by haphazardly operated crusher plants along its bank has changed its color remarkably. The water is further made filthy by the people living alongside its bank. At its source, the base of the Machhapuchre Mountain, its water is fresh and clean. But its water quality is degraded as it travels from Pokhara to Tanahu. The river is filled with plastic bottles, plastic bags, and chemicals released by human settlements and crusher plants on its bank. There are few sections where the water looks less like water and more like contaminated liquid chemicals. People say that they have not seen the pure form of the Seti River for a long time now and mostly blame the mushrooming crusher plants on its bank. 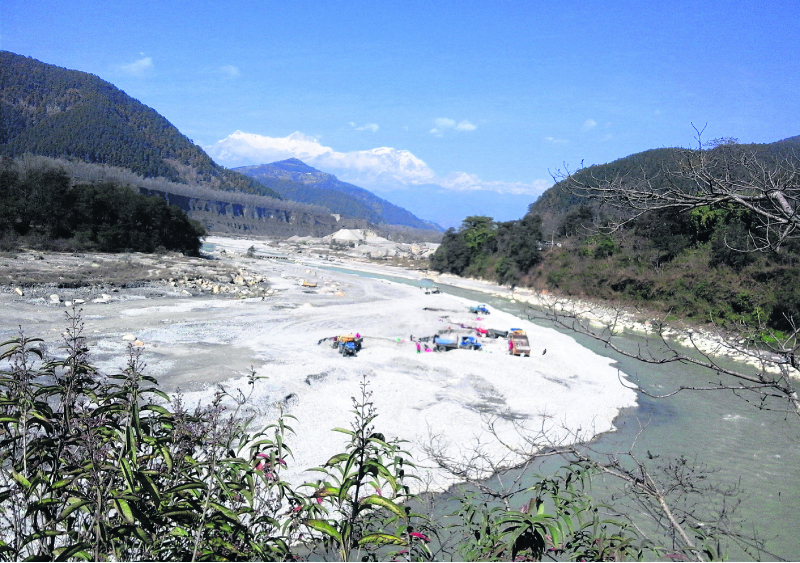 There are 10 crusher plants just within Shuklagandaki Municipality which lies between the border of Kaski and Tanahu district. These plants do not have any wastage management system. All their solid and liquid waste is directly released into the river. Purna Bahadur Ale, a local of the municipality, accused these plants of turning the river into a dumping site. Along with that they extract stones and sand from the river bank, he said. “Before reaching the location of these crushing plants, the river’s water looks clean but if you look at it after it passes through, its water looses color and is full of filth. In just a small distance, the water is totally contaminated. It is filled with red, blue, green and all sorts of wastes,” Ale said adding that these factories release the waste into the river during the day. Locals state that the river’s water stinks during the day and it is unbearable for them to go near it. Rock Garden is a very popular tourist site in the locality and Seti River was one of the major attractions for tourists who visited it. However, nowadays tourists don’t go near the river because of the stench coming from it and its repelling look. “The river used to attract a lot of tourists earlier. Tourists coming to Rock Garden would stroll on the river’s bank and play with its water. This has changed. Now the tourists don’t even look at it and rush to escape the strong stench coming from it,” Ale said. Environmentalist Ekraj Sigdel said that it is a serious case of serious environmental degradation and warned that water polluted to such an extent will affect the biodiversity. “River pollution has long and short term impact. It is a very serious matter. Wastage released by crusher plants into the river is extremely harmful. Concerned authorities should check this immediately,” he asserted. “Because of the pollutants, the river’s color changes in various places. Its color is fine when it reaches Pokhara but as it passes through human settlement, its water quality degrades gradually,” he added. Sigdel expressed concern that the water might be even poisonous and maybe affecting animals and humans depending on it. Professor Nawaraj Khatiwada of the Kathmandu University also shared similar concerns. Domestic animals that depend on the river for water may have been affected because of the pollutants in the water, he said. “In Kathmandu, Bagmati’s polluted water caused skin disease. Polluted water affects everyone, whether human or animals. The contamination should be checked by concerned authorities and save the river from further degradation,” he noted. Giving examples of developed countries, Khatiwada said industries polluting environment are severely punished by the state. “But in our country industries are not booked even if their businesses massively degrade the environment. In lack of action from the concerned authorities, they continue harming the environment,” he said.